Wow! What can we say about this year’s Folk ‘n Bluegrass Festival? The weather was a classic crystal blue skies Pagosa weekend and the crowd was festive and friendly. Below are some of the video clips I filmed during Saturday and Sunday afternoon featuring Warren Hood & The Goods, Eddie From Ohio, The Dixie Bee-Liners, Crooked Still and Solas. Below the videos is an embedded video series featuring all the video I shot. 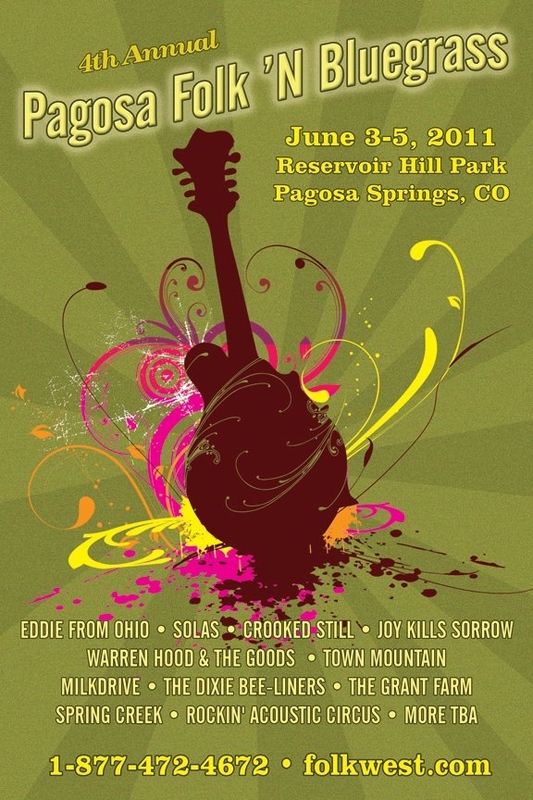 You can also view this series on my 2011 Pagosa Folk ‘n Bluegrass channel on YouTube. This video shows Niamh singing a beautiful song while the camera pans across the crowd. Solas’ final song “Coconut Dog” electrified the crowd. Eddie From Ohio Closed out the Main Stage on Saturday. Crooked Stills Opening Song On Their Set Sunday. Crooked Still Performs a Vicious Murder Balet. And one more song from Crooked Still since we like them so much. Dixie Bee-Liners perform “Lord, Lay Down My Ball and Chain” (Sorry, I had a loud group next to me on this song).